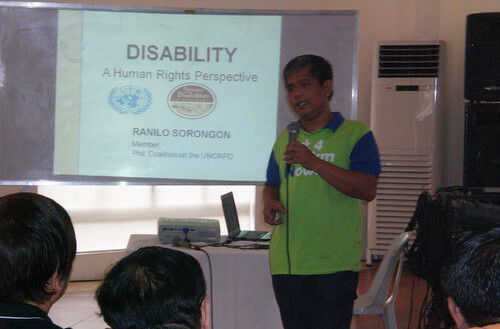 The Regional Council on Disability Affairs, National Capital Region (RCDA-NCR) invited ASP Executive Director Ranil Sorongon to give a lecture on “Disability: A Human Rights Perspective”. The main aim was to slowly develop a human rights perspective among the government employees, the “duty bearers” as well as the persons with disabilities (PWDs), the “rights holders” who were the participants of the event. Thus, a shift from the medical model to the rights based model of looking at disability has the main goal of this lecture. Ms. Rosalyn Marie Sorongon or Teacher My was also invited to give a lecture on “Understanding Autism and Its Management”. Teacher My discussed the short history of autism, the signs and symptoms, some management strategies and the effects of autism in the family. More than 40 participants listened to the autism seminar and most were struck and/or alarmed with the growing incidence of autism. As a result, they clamored for another seminar on autism in the near future specifically for families and teachers. The two lectures done last 25 March 2013 were part of the capacity building effort of the RCDA-NCR to equip its members with positive attitude, knowledge and skills to properly respond to their constituents with disabilities. RCDA is headed by Regional Director Alicia Bonoan as the Chair and Executive Director Ranil Sorongon as the Vice Chair. RCDA wishes to thanks Mayor Sherwin Gatchalian and the City Council of Valenzuela City for sponsoring the venue and the food of the seminar, and Ms. Thine and Mr. Ken of the City Social Welfare and Development Office for their hospitality.